MS Ferguson 67, f. 25r. It is certain that women have participated in the practice of alchemy since its beginnings, but hard documentation is scant. Maria Prophetissima, also known as Mary the Jewess, is perhaps the best known female alchemist. None of her writings have survived, but she is thought to have lived around the third century. Legend tells that the "bain-marie" (double boiler) is named after her. 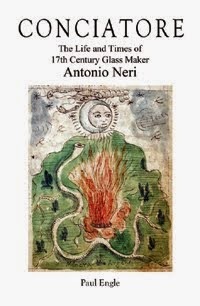 In the seventeenth century, celebrated glassmaker and alchemist Antonio Neri provides us with further detail, even if raising more questions than answers. 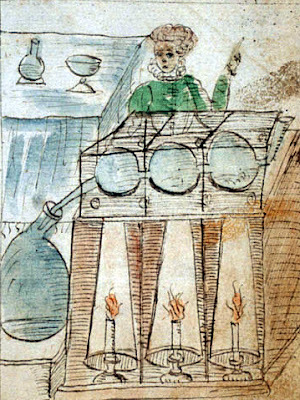 One of his manuscripts, entitled Tesoro del Mondo (Treasure of the World) depicts three women running chemical equipment. Unfortunately, we are left to guess who they were and what role they played in the larger Florentine technical arts community. It is possible that these were nuns, trained in the same Church sponsored educational system that produced Neri. Convents were often expected to be self-sufficient and many ran their own pharmacies. Neri had sisters as well as brothers and at least one sister entered a convent located on the north side of Florence, near the laboratory where Antonio practiced alchemy and made glass. The fact that specific names have not been associated with Neri’s three female co-workers should not deter us from celebrating their contribution to the birth of early modern science. Within a year of his ordination in the Catholic Church, Neri began an ambitious treatise, illustrated in his own hand, devoted to "all of alchemy." Six of the illustrations in this manuscript, completed in 1600, show women tending equipment. It is not remarkable that some alchemists of the 16th century were women, what is remarkable is to find them in the historical record. Direct depiction of female participation in alchemy is otherwise extremely rare. MS Ferguson 67, f. 35r. work. In both cases, the technician stands behind a dedicated piece of apparatus, facing forward, giving the impression of propriety in an arranged portrait. In other words, Neri is drawing his co-workers at their stations, practicing their art. The first drawing depicts a furnace and vessels used to make liquid mercury from its ore. 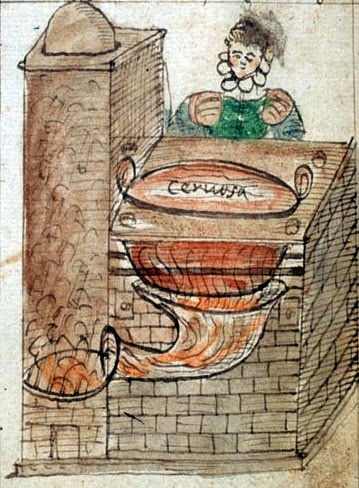 The other shows a different type of furnace with a 'tower,' used as an efficient way to cook ceruse (white lead oxide). These images are part of a larger set of two dozen similar drawings that each illustrate the equipment used to prepare a specific product, many include a furnace and glassware. Nine of these show a single individual, (or in one case two men) tending the equipment. Because the manuscript is a recipe book, it contains almost no personal information. However, the context of these illustrations indicated that like their male counterparts, the individuals depicted all have specific responsibilities and specializations within the workplace. Three other illustrations in the manuscript are notable for their engagement of women. These pictures show details of kitchen and nursing work; what might be termed more traditional female roles in the sixteenth century. Two of these illustrations are devoted to the respective arts of preparing plants and animals. They show women working alongside men performing various tasks. 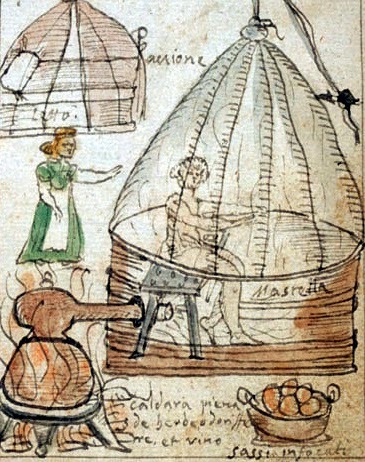 A third illustration shows medicinal fogging tents tended by a woman. Inside one tent, a male patient sits naked on a bench, exposed and breathing fumes pumped in by a large vessel perched over a fire. Similar arrangements are known to have been used to treat skin lesions caused by leprosy and syphilis. MS Ferguson 67, f. 37r. The circumstances in these images present other possibilities to Antonio Neri's work environment. One is that the scenes take place at the Neri household on Borgo Pinti in Florence. Antonio's father was the personal physician to Ferdinando de' Medici, the grand duke of Tuscany. He was also the head of the college of physicians in Florence, and presumably ran a thriving private practice. The women may be Neri's siblings or other family members. Another possibility is that we may be looking at operations inside the Casino di San Marco soon after prince Don Antonio de' Medici's occupation of the facility. This palace laboratory had a reputation for medical cures that extended throughout Europe. Don Antonio spent extravagant sums to learn alchemical and medicinal secrets. The glass furnace here, which had employed masters from Venice is where Neri began formulating glass. The presence of women among his colleagues indicates a social setting with a camaraderie not displayed in other alchemical works of the period. * This post first appeared here on 17 March 2013 in a slightly different form.